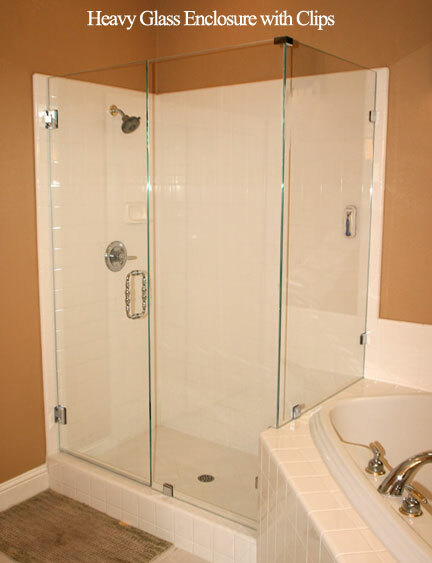 Welcome to the Insight Glass Shower/Tub educational page. At Insight Glass, we believe an educated customer leads to a satisfied customer. Since Insight Glass offers such a wide variety of enclosure options, configurations and hardware, we have published this page to educate and answer your questions. 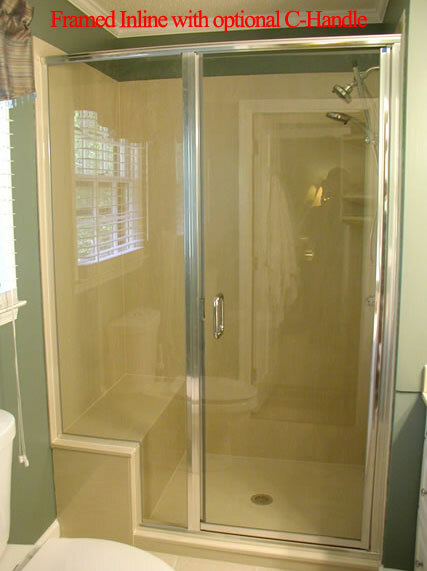 A framed Shower Enclosure has aluminum framing around the perimeter of all the glass. The glass thickness standard for a framed enclosure is 3/16" but can be upgraded to 1/4". 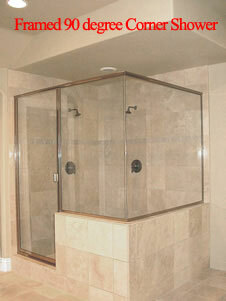 Insight Glass offers Cardinal Shower enclosures for our framed units - High quality enclosures built strong to last. 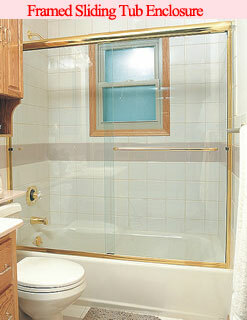 A frameless Shower Enclosure (also called a Heavy Glass shower), has glass thickness of 3/8" to 1/2". 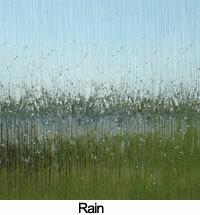 Because the glass is so thick and sturdy, it does not require the framing support of thinner glass. 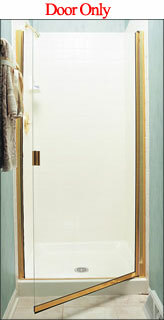 A frameless enclosure is installed with either U-Channel or Clips (see photos below). It is a personal preferance on deciding between U-Channel and Clips, however, U-Channel is the preferred installation method when the walls are not plumb (out conditions) as clips will leave gaps. To learn more about the differences between Framed, Semi Frameless and Frameless Shower Enclosures, click here. Many times, the door with inline panel and the 90 degree corner shower have a notched panel that sits on a butress. The project managers at Insight Glass will be more than happy to guide you through the process of designing your dream shower. All shower glass is tempered for safety reasons so if you have the misfortune of breaking the glass, you will have a million tiny pieces instead of some large, dangerous slivers. 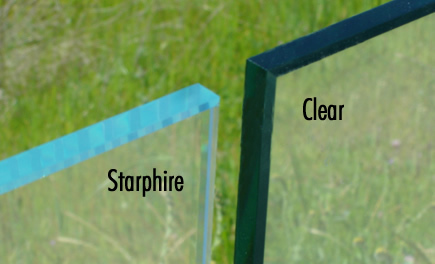 Clear glass is by far the most popular but some fairly common options include Rain, Obscure and Starphire. Clear glass has a slightly green tint that becomes a little more pronounced as the glass gets thicker. The edges of clear glass also has a green cast that becomes darker as the glass becomes thicker or larger. If a dark green or blackish edge color is undesireable, Starphire glass, which has a jewel-like blue edge, may be more to your liking. 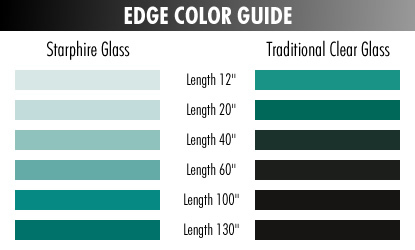 While the glass edge color may not be hugely important to you, we at Insight Glass like to educate our customers to avoid any surprises. 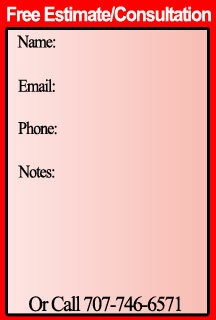 See pictures and chart below. To see a few other glass types, click here. The three most popular colors for shower framing, clips and hardware are Chrome, Brushed Nickel and Oil Rubbed Bronze with Chrome the most in demand. 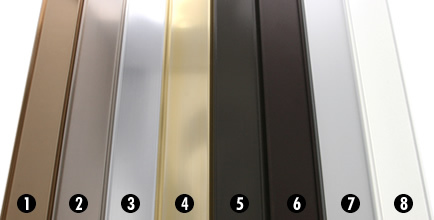 The colors below are available for our semi frameless shower enclosures. To view the colors available for our heavy glass (frameless) enclosures, click here. 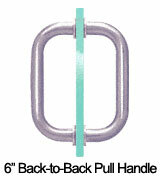 Hardware options include Pull Handles, Towel Bars, Pull Handles/Towel Bar combination, and Knobs. These options all include hole cutouts in the glass so unless you decide on 3/16" thick glass (no cutouts thus no hardware options), you will need to choose. Insight Glass partners with C.R.L., a leading supplier of shower enclosure hardware for these parts. The BM series is the most popular and you can view photos of the most common items below. To see more details on hardware options, click here. Insight Glass hopes this page helped answer some of your questions. 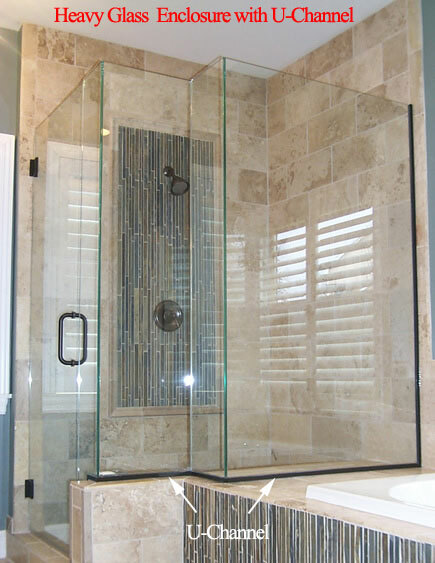 At Insight Glass, we understand that purchasing a shower enclosure will not only beautify your bathroom, but is an investment that will add value to your home. That's why we've developed this page to equip you with the information you need to make an informed decision.